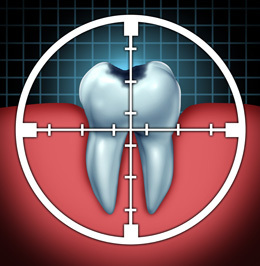 At one time in history, dental decay or cavities were a national epidemic! But gratefully with the spread of dental education and prevention, there has definitely been an increase in Dental and Oral IQ! You are now in the population that is more aware about your dental health than any previous generations. In fact, the latest thinking and trend in Dentistry today is to evaluate someone’s cavity risk and then trying to management and prevent decay before it starts. Dr. Singh realizes the importance of this “Caries Management by Risk Assessment (CAMBRA)” protocol that she has authored an article on this topic and dental schools are now even incorporating this into their dental curriculum to train the next generation of dentist this important evaluation. That being said, due to the sugars that we consume and the bacteria that live in our mouths, cavities do still happen. Therefore it is important to understand that there are many ways to address decay. Sometimes the decay is so horrible that the tooth needs to be removed; then there are a variety of options that can be utilized to restore the mouth.